Touch rugby is the non-contact version of rugby league, a popular version of rugby played professionally in the UK, Australia, New Zealand and elsewhere. Given the game is a non-contact sport, it is suitable for men and women of all ages and skill. Touch also allows players to make moves, passes and runs that would be considered too risky in games of full-contact rugby. Its fast-paced play makes for a fun time and excellent workout! More information on rules can be found here. Full touch rules governed by the Federation of International Touch (FIT) can be found here. I’m up to play. It’s been a good bit but looking for something to do. Hey! I haven’t played in years but I’ve been looking for a league, how often do you guys play pick up and are girls welcome??? 🙂 I played 4 years varsity in high school. Hi Michelle, yes you’re more than welcome to join us! All skill levels are welcome! 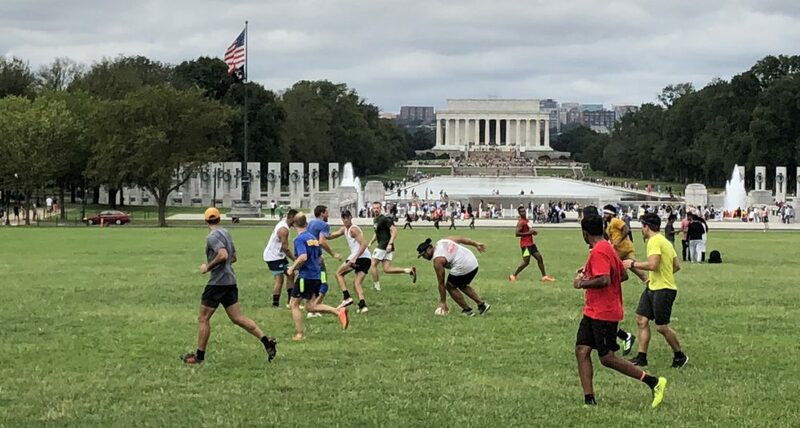 We usually play every Saturday on the mall at 10AM but check the blog around Thursday to see if the game is on as sometimes it can change/cancel due to bad weather. See you soon! HI DC TOUCH.. This is Tony from Columbia.. No doubt you have seen the announcement about the WILD GEESE TOUCH Tournament 14 June. Are you interested in getting together for a few Touch sessions in the coming weeks? Tried to play full go last fall for the first time in awhile but old injuries caught up to me. Love the sport and looking to play forward to playing a little touch!